Commonly named for the attractive, exfoliating bark of the species, growing Ninebark shrubs is simple. Their are two factors to successfully grown Ninebark, the location and soil you choose. A North American native, Ninebark, prefers a soil that is only slightly acidic and location that is sunny to lightly shaded. When planting, dig a hole as deep as the container holding the shrub and twice as wide. Make sure the crown of the Ninebark is even with the top of the soil surrounding the planting area and water well until established. Established Ninebark shrubs are drought tolerant and can thrive with only occasional watering. Pruning for shape and thinning inner branches will likely be all that is necessary to keep growing Ninebark shrubs healthy and attractive. Amber Jubilee Ninbark was created in honour of the Queen's Diamond Jubilee. It is a unique blend of foliage colors. New growth takes on shades of yellow and orange in the Summer, matures to lime-green and then turns Purple in the Fall. Little Devil Ninebark is covered in deep burgundy foliage on this dense, rounded, upright shrub. In spring, it is covered with small pinkish white flowers that compliment as well as create contrast against the dark foliage. Dart's Gold Ninebark has striking foliage color on a compact, mounded shrub with small white flowers. Large maple-like leaves emerge bright golden yellow in spring, age to lime green, then take on a golden hue with a bronze tint in fall. Tiny Wine is a dwarf variety of Ninebark that is extra full with small, refined leaves. 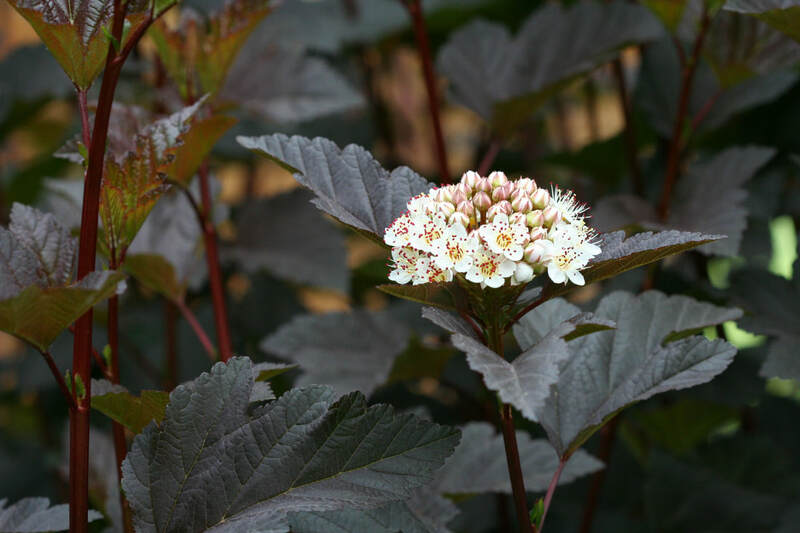 The dark bronze-maroon foliage is colorful all season and contrasts beautifully with dainty, soft pink and white flowers in late spring that cover the stems. Diabolo Ninebark's stunning, deep purple foliage makes it a standout in the garden. A great dense hedge or screen shrub. Diabolo has profuse creamy-white flowers in summer. The foliage can become green in high heat or partial shade.